We’ve been talking about the coming of mobile marketing for a long time now. I remember talking about it when I was doing work for one of first PCS carriers, Aerial Communications (now owned by T-Mobile), back in 1995 of so. Mobile marketing has taken far longer to evolve than people imagined, but I believe we are on the doorstep of an evolution in marketing that will rival social media in terms of impact. First off, what is mobile marketing really? To me it’s not a hot trend driven by some new killer technology so much as a realization of the fact that more people have mobile devices than land lines and those devices have evolved to contain the power of usability of multiple devices, including desktop computers. According to industry source dotMobi four mobile devices are purchased today for every personal computer purchased. My current mobile device is a phone, email client, web browser, digital camera, video camera, digital recorder, music player, alarm clock, navigation system, compass, calendar, to-do list, flashlight, book reader, hard drive, guitar tuner, and four-track recorder. People are using mobile devices for everything, including surfing and shopping for local businesses, products, and services. Marketers must now come to grips with the inclusion of this device as one of the considerations whether it’s to broadcast or be found. In this coming year the buzz around mobile marketing will get very strong as big brands rush to create text coupons, iPhone apps, and offerings based on your phone’s current location, but most small businesses can play in the mobile game by simply making these subtle changes. The first step to getting involved in mobile marketing is getting educated. These sites are a great place to start. Bookmark the mobile versions of the major search engines and start learning how differently they return and display search results. This is an important area as mobile SEO will differ for now from traditional SEO and understanding the differences is a part of the game. Mobile marketing may be more important to some industries or target market demographics initially than others. Restaurants and anyone trying to attract customers under 30, for example, have better jump in with both feet, but eventually the local accounting firm will need to master mobile marketing as well. One of the first steps is to get a sense of how many people today are visiting and viewing your web sites using a mobile device. There are many things that can be done to address the needs of this audience once you start to learn about them. Mobile web analytics packages have become popular in recent years. Mobilytics is a free tool that can track mobile site traffic and web application usage. While mobile coupons and location based offers may seem far off for your local small business, the fact that a growing percentage of web surfers use their mobile devices to view your web site is here today. 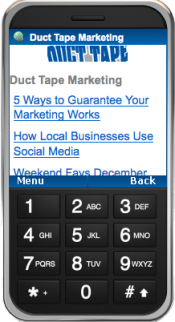 Creating a mobile version of your web site must become a priority. There are a number of ways to address this task. You can work with a designer to create a smaller, simpler site that involves mobile standards or you can employ one of the growing number of bridge tools that can convert your site. For now, the mobile site converter tools look very promising as a way to get a mobile version of your site immediately and also include some of the necessary SEO, sitemaps and analytics at the same time. MoFuse – this paid service can convert your entire site and put it on a custom domain such as m.ducttapemarketing.com. The good news is that you can get your blog converted for free. Tools like the ones listed above are a great solution right now, but I suspect, as mobile sites become the norm, web design firms and open source plugins will create mobile versions of sites as part of a standard package. Auto detection – A word about mobile domains. Once you create a mobile site with its own URL you will want to make sure your server determines when a mobile browser in visiting your primary site URL and automatically redirects it to your mobile site. This way you won’t need to promote two separate URLs. This is standard in most mobile site converters, but you may need to add some code to the head of your main site to facilitate this step. Here’s some bonus reading on Mobile Site Detection. Text messages get read – depending on the source, research suggests it’s over 90%. So, at some point, small businesses will need to embrace text message (also called SMS) campaigns. This new frontier will eventually suffer fatigue in ways the email enjoys currently, but done right, it is a powerful new tool. One very simple principle to get started – this is not another broadcast channel, it’s a way to offer useful information to people who want to receive it. Choosing the right vendor and strategy is key to your success. Offering coupons, Text2Win, and SMS auto responder campaigns are a few simple ways to start building a Text Message database for future use. Eventually you may feel the overwhelming need to create your very own mobile applications like those you see in the iTunes app store. You can hire a programmer to create a custom app or check out one of these low-cost simply builders. As users choose mobile apps over web based sites this is a tool that many businesses must consider even for content that is available on their main site. One final thought and plea for you to get your company listed with the local search directories. A great deal of local search on the mobile device (ie: people looking for a local business to buy from) will happen around the local search directories that are powered with click to call, maps, directions, and coupons. This may be the highest priority if you haven’t yet claimed this real estate.